Although order was restored following the rioting on Temple Mount on the eve of Succot (September 27th), the attempts by Palestinian agitators to inflame tensions at the site did not end there. “Palestinian protesters are planning for more violence on the Temple Mount in Jerusalem on Monday, stockpiling rocks inside the al-Aqsa Mosque at the site after a morning of clashes, new images indicated Sunday. The photographs, which Channel 2 television said Sunday night were released by Palestinians and obtained by Jerusalem district police, show lines and heaps of masonry inside the mosque, hours after rioters clashed with police as Muslims marked the end of Eid al-Fitr [sic – actually Eid al Adha – Ed.] and Jews prepared to celebrate the festival of Sukkot. According to Channel 2, the stones were prepared in advance of Monday’s return of Jewish visitors to the Temple Mount, after they were banned from entering Sunday in an effort to maintain the recent calm after days of riots. Some religious Jews traditionally ascend to the site, considered the holiest in Judaism, during the week-long Sukkot holiday that began Sunday evening. And indeed, early the next morning – September 28th – the rioting recommenced. “Police said forces entered the Temple Mount at approximately 6:45 Monday morning after repeated efforts at dialogue to end the standoff and clear the site of dangerous materials failed. “There have been fresh clashes between Israeli forces and Palestinians at a disputed holy site in Jerusalem. Only in the article’s sixth paragraph did readers gain an inkling of insight into the premeditated nature of the violence. Baseless rumour rooted in deliberate incitement was again amplified but, in contrast to the previous day’s report, this time at least the Israeli side of the story was included. “Palestinians have been alarmed by rumours that Israel is planning to change the delicate status quo at the Haram al-Sharif/Temple Mount compound, which allows Jews to visit the site but not pray there. However, Israel’s prime minister has insisted he is committed to maintaining it. As was later reported after calm was restored, the ‘increased’ number of Jewish visitors to Temple Mount on September 28th came to the grand total of twenty-four. Although these repeated incidents of violent rioting on Temple Mount inevitably receive BBC News coverage, audiences have not been provided with the back-story which would enable them to understand the issue properly. Like its predecessors, this article too neglects to tell audiences about the frequent and extensive incitement coming from official Palestinian sources as well as others and no information concerning the Northern Islamic Movement and Hamas funding of the agitators on Temple Mount is included in the report. Moreover, the BBC has on occasion uncritically amplified the myths, rumours and libels which underwrite the violence on Temple Mount, thus contributing to the entrenchment of this particular lethal narrative. 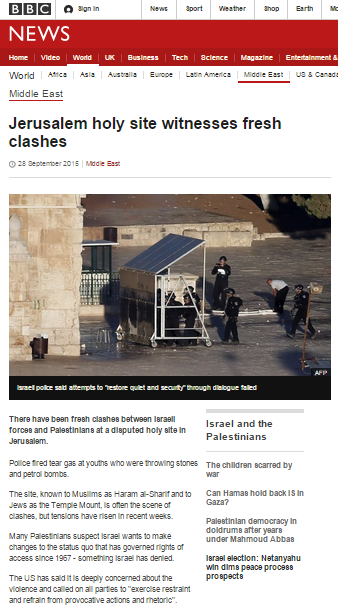 In the absence of that essential background, BBC audiences continue to be herded towards the mistaken view that this recurring story is about “clashes” which occasionally and mysteriously ‘break out’ between Palestinian “protesters” and the Israeli police rather than an ongoing attempt to gain exclusivity on Temple Mount and prevent access for members of two of the three religions for whom the site is significant. It is high time the BBC got round to telling its audiences the real story. As was the case on the previous Jewish holidays of Tisha B’Av and Rosh HaShana, on the eve of Succot (September 27th) Palestinian agitators once again initiated violent riots on Temple Mount and the Israeli security forces were obliged to intervene in order to keep the peace. ““Masked youths threw stones and shot firecrackers at police and Border Police securing the site,” police said in a statement. The rioting took place despite the fact that the site had been closed to Jewish visitors. 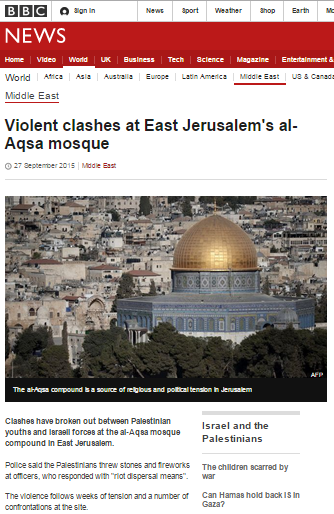 However, visitors to the BBC News website’s Middle East page on September 27th learned from an article titled “Violent clashes at East Jerusalem’s al-Aqsa mosque” that the violence just ‘broke out’ all by itself. Once again audiences were presented with an inadequate portrayal of the significance of the site in the Jewish religion. The article presented readers with a number of statements apparently intended to tick the box of providing context to the story – but which failed to inform audiences of its real background. Yet again the BBC refrained from informing audiences of the organised nature of the violent incidents on Temple Mount, of the incitement which underwrites that violence or of the funding of agitators at the site by Islamist elements. In fact, even though the BBC has recycled that above latter paragraph several times over the past few weeks, no effort has been made to inform audiences who those “two Muslim groups” are, where their financial support comes from or why they were banned. Readers of this article were also invited to step into the rioters’ shoes. Only later on in the article were readers informed that in fact there was no basis for those ‘fears’ because visits by Jews had been halted. No effort was made to clarify to readers that attempts to prevent non-Muslims from visiting Temple Mount contradict the “Protection of Holy Places Law” and go against the agreed status quo at the site. The article also amplified rumours concerning Temple Mount but failed to inform readers that those claims have no basis in reality and that the Israeli government has repeatedly voiced its commitment to the current conventions governing the site. This of course is far from the first time that the BBC has amplified baseless rumour concerning Temple Mount whilst failing to inform its audiences worldwide of the facts behind the story and the politically motivated sources of such incitement. The following day also saw riots on Temple Mount and a new BBC News website article on the subject. That report will be discussed in a future post. “The idea that the Assad regime’s violence is somehow morally or strategically different to that of jihadist actors in Syria has become fashionable among some sections of the Western media. Perhaps a symptom of fatigue or sympathies forged during time spent as guests of the regime, mainstream commentators such as Patrick Cockburn and Peter Oborne have been at the forefront of this trahison des clercs. As readers are already aware, the BBC – and in particular its Middle East editor – also appears to have been afflicted by that particular trend. However, it would appear that following Jeremy Bowen’s repeated uncritical promotion of Bashar al Assad’s agenda earlier this month, some damage control was deemed appropriate and that came in the form of an article by Charles Lister which appeared on the BBC News website’s Middle East page on September 28th under the title “Viewpoint: West ‘walking into abyss’ on Syria“. Meanwhile, the Assad regime has conducted a consistent policy of intentional mass killing of civilians – first with air strikes and ballistic missiles, then with barrel bombs and widely alleged use of chemical weapons. 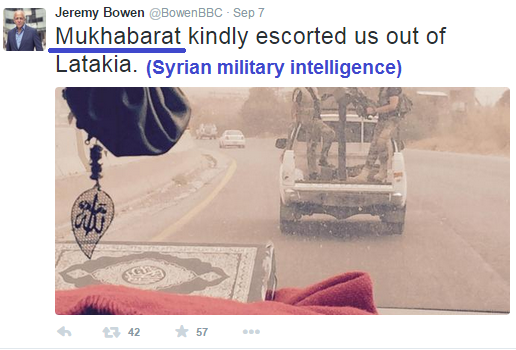 Of course BBC audiences – who only a short time ago were informed that “the Syrian army has never, ever attacked or initiated any attack against a city or against a village” and that “the real threat in Syria is Islamic State, not the country’s leader” – may well find that this latest article only adds to their confusion seeing as it contradicts everything they were told in Jeremy Bowen’s numerous reports. Rather than helping audiences to form a clear picture of what is happening in Syria and why so many people are fleeing to other countries as its public purpose remit demands, the BBC’s indulgence of Jeremy Bowen’s partisan reporting serves only to muddy audience understanding of this topic. 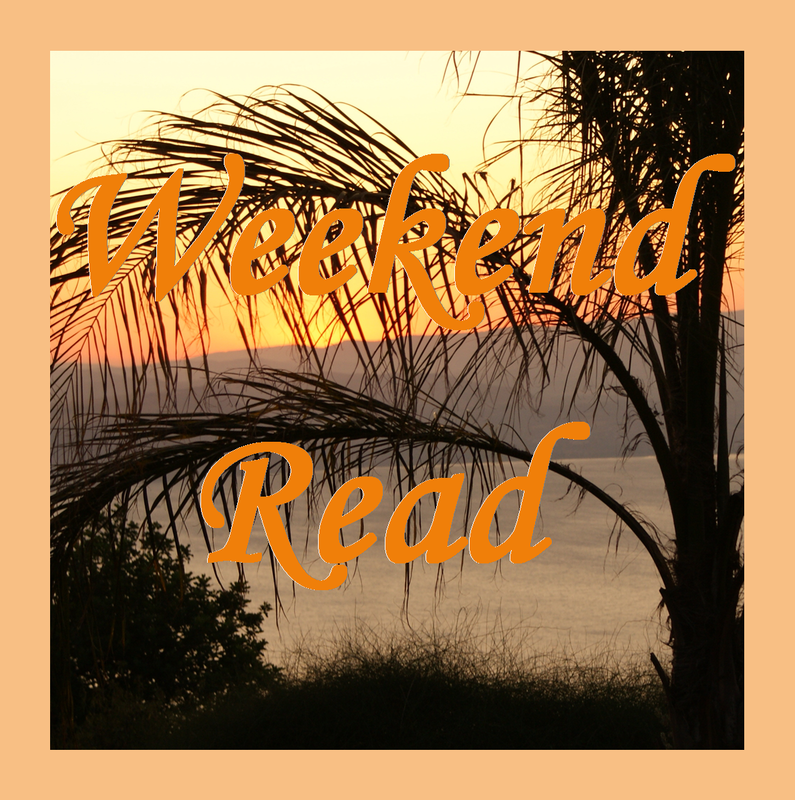 September 26th saw yet another incident of spillover fire from the fighting in Syria in the northern Golan Heights. “A rocket launched from Syria fell in open territory in the northern Golan Heights on Saturday evening, causing no injuries or damage. Air raid sirens were not triggered in the incident. The following day a similar incident occurred in the same area. “A rocket fired from war-torn Syria strayed into the Israeli sector of the Golan Heights on Sunday, the Israeli army said, in the second such incident in as many days. The Israeli military said the rocket crashed into a field without causing any casualties or damage. Neither of those incidents was covered by BBC News. Later on the evening of September 27th Israeli forces responded to the two incidents. “An Israel Defense Forces spokesman confirmed that the IDF had conducted two artillery strikes on Syrian positions on the outskirts of Quneitra following earlier rocket strike in the Golan on Sunday night. 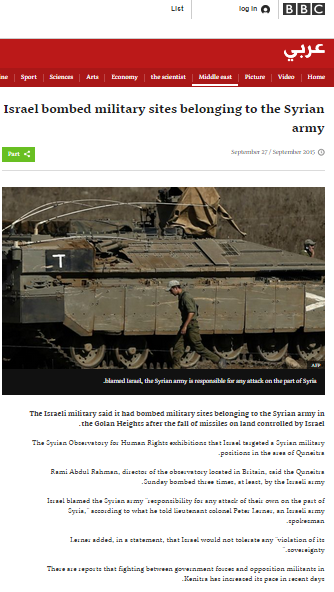 Whilst that event was also ignored by the BBC’s English language services, as has often been the case when Israel has responded to missile fire from the Gaza Strip in recent months, the Israeli action was the focus of an article appearing on the BBC Arabic website on September 27th under the inadequate headline “Israel bombed military sites belonging to the Syrian army“. As noted here previously, BBC News’ reporting on the stoning attack in Jerusalem on September 13th which caused the death of Alexander Levlovich, as well as injuries to two other passengers in his vehicle, was remarkable for the fact that audiences were not provided with any information concerning the identity of the attackers. A later article in which that incident was also mentioned similarly disconnected the attack from its context. On September 26th the Israeli security services announced the arrests of four suspects from Sur Baher in connection with that attack. “They were identified by the Shin Bet as Muhammad Salah Muhammad Abu Kaf, 18, Walid Fares Mustafa Atrash, 18, and Abed Muhammad Abed Rabo Dawiat, 17. The fourth suspect’s identity was not revealed. During their interrogation, according to the Shin Bet, the four admitted to setting out on the evening of Rosh Hashanah to attack Israeli cars. “Doiat [Dawiat], who confessed to throwing the large rock that killed Levlovitz, said he wore a Hamas flag he received earlier in the month at an “Al-Aksa is in Danger” demonstration against the banning by the defense minister of two radical Muslim groups from the Temple Mount. As has been noted on countless occasions on these pages, the BBC has consistently failed to inform its audiences on the issue of incitement in general and the activities of the Hamas-linked Northern Islamic Movement (including on Temple Mount) in particular. The complete absence of coverage of that very relevant issue means that not only are BBC audiences being denied the full range of information which would enable them to properly understand this particular “international issue” but they are actively being misled with regard to the back story to violent attacks on Israeli citizens. 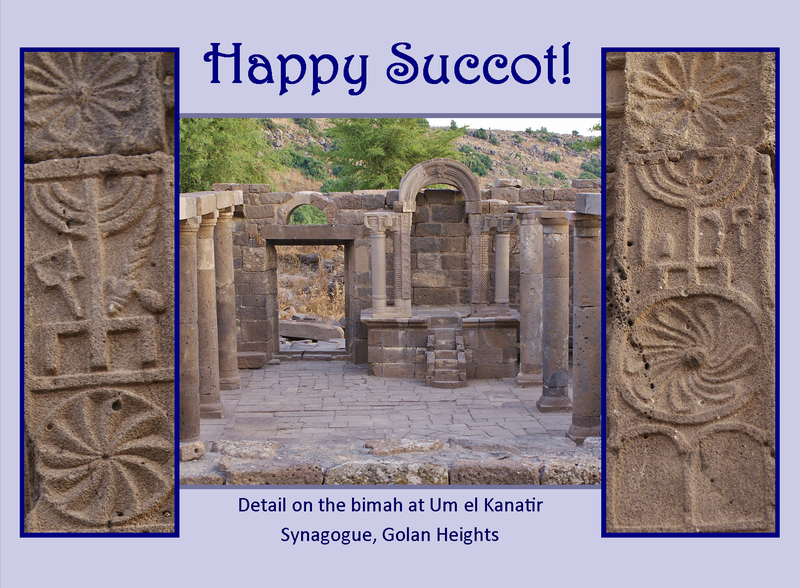 Wishing all our readers celebrating Succot a very happy holiday. 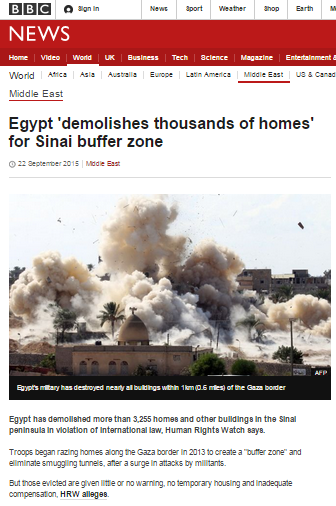 On September 22nd an article appeared on the BBC News website’s Middle East page under the title “Egypt ‘demolishes thousands of homes’ for Sinai buffer zone“. That article is in fact yet another piece of ‘churnalism‘, with almost its entire content being devoted to amplification of a report by one of the BBC’s most frequently quoted and promoted political NGOs – Human Rights Watch (HRW). Despite the fact that the HRW report is based on information gathered from selected media reports, anonymous witnesses and unidentified ‘activists’, the BBC uncritically repeated its claims, with variations of the phrase “HRW says” appearing seven times throughout the article and no attempt made to provide readers with further relevant background material. Thus, for example, readers were steered towards the view that no justification exists for Egypt’s actions on its border with the Gaza Strip. “The [Egyptian] military aims to eventually clear an area of about 79 sq km (30 sq miles) along the Gaza border, including all of the town of Rafah, which has a population of about 78,000 people, HRW says. The government says the operation will allow the military to close smuggling tunnels it alleges are used by jihadists to receive weapons, fighters and logistical help from Palestinian militants in Gaza. “Egyptian intelligence has specific information on assistance that Sinai terrorists have been receiving from the Gaza Strip. Many activists trained in Gaza, and received arms there that they have been using against Egyptian forces. As has been the case on many past occasions, the BBC makes no effort to inform readers of this article of HRW’s political agenda – despite the need to do so being clearly stated in the corporation’s editorial guidelines on impartiality. That recurrent omission is all the more remarkable in light of the fact that in earlier this year, HRW (once again) took up the BBC’s case at the United Nations periodic review of Rwanda. Public impressions of BBC impartiality and independence will of course not be enhanced by the appearance of articles uncritically amplifying content produced by a political NGO which just happens to have used its UN platform to promote the BBC’s interests. Throughout the past week Israeli citizens have continued to be plagued by terror attacks. On September 21st a missile fired from the Gaza Strip exploded in the Hof Ashkelon region. On the same morning an IDF soldier was injured near Joseph’s Tomb. “Dozens of Palestinians threw stones and Molotov cocktails, and rolled burning tires downhill at the soldiers, inflicting light to moderate injuries on the soldier. 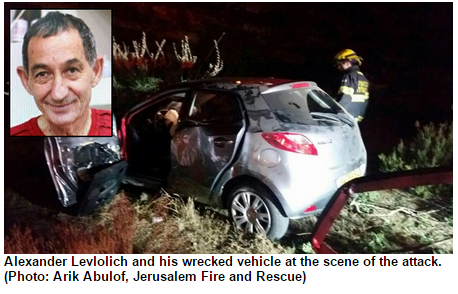 Israeli motorists continued to be targeted in stoning attacks and firebomb attacks. “On Route 443 northwest of Jerusalem, Palestinians threw stones at passing motorists, damaging three cars. Stones were also thrown at Israeli drivers on Route 60 near the Beit Anun intersection near Hebron, in the southern West Bank. On September 24th a Palestinian man carrying explosives was apprehended in the Jordan Valley, firebombs were thrown at the community of Psagot and several cases of arson were reported. “Fire caused damage to the balcony and garden of a home in the Jerusalem neighborhood of Abu Tor overnight on Wednesday. An investigation by the fire department found that it was caused by a Molotov cocktail thrown at the adjacent building. A brush fire also broke out near Moshe Dayan Boulevard in the northern Jerusalem neighborhood of Pisgat Ze’ev. The fire was suspected to have been deliberately started. On September 24th it was reported that sulfuric acid bound for the Gaza Strip had been intercepted after passing through the Nitzana crossing. “The acrid smell of the shipment, which was recorded officially as 30 tons of paint thinner, aroused the suspicion of Shin Bet and customs officials at the Nitzana border crossing with Egypt. At least half of the shipment, it turned out, was sulfuric acid. Sulfuric acid is banned from import to the Gaza Strip through Israel. It is a key component in producing explosives such as nitroglycerin and TNT. None of the above was reported on the BBC News website. The only terror-related incident (although not defined as such to BBC audiences) which did receive coverage during the same week involved a Palestinian woman who was shot after trying to stab a soldier in Hebron. 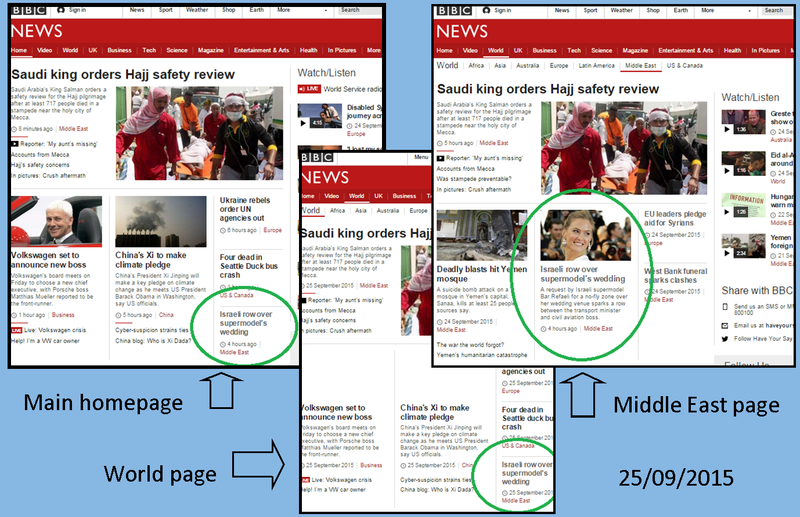 On the other hand, visitors to the BBC News website on September 25th did find a vacuous written report about Bar Rafaeli’s wedding on the site’s main homepage, on its ‘World’ page and on its Middle East page. 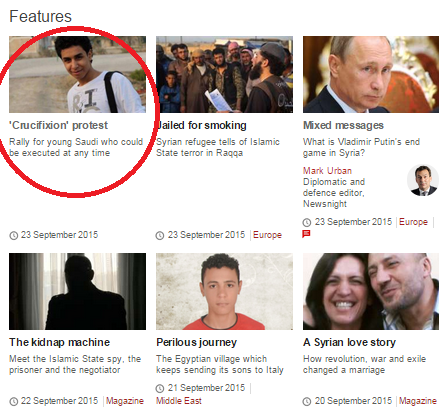 In addition, a filmed report on the same topic appeared on the website’s Middle East and ‘Video’ pages. Yes – a supermodel’s nuptials really were deemed more newsworthy by the self-styled “standard-setter of international journalism” than missile attacks, stoning attacks and firebomb attacks on civilians or attempts to smuggle bomb-making materials into a terrorist-run enclave. Back in July, BBC coverage of the P5+1 deal with Iran included assurances from some of the corporation’s senior correspondents that funds freed up by sanctions relief would be used by the Iranian regime to improve the country’s economy. “In exchange it [Iran] will get a lot. It will get a release of the punishing sanctions. We heard from Hassan Rouhani saying as Iran always says that the sanctions did not succeed but he conceded that they did have an impact on the everyday lives of Iranians. There’s an estimate that some $100 billion will, over time, once Iran carries out its implementation of this agreement, will be released into the Iranian economy.” Lyse Doucet, Newshour, BBC World Service radio, July 14th 2015. Notably, BBC coverage avoided the issue of the potential for increased financial support to Iranian projects and terrorist proxies in the wider region and even went so far as to censor a pledge of support for the Syrian regime and for terrorist organisations including Hizballah, Hamas and the Palestinian Islamic Jihad from its reporting on a speech made by Khamenei. Dr. Emanuele Ottolenghi – Foundation for Defense of Democracies – ‘The Iran Nuclear Deal and its Impact on Iran’s Islamic Revolutionary Guards Corps’. Dr. Matthew Levitt – The Washington Institute for Near East Policy – ‘Major Beneficiaries of the Iran Deal: IRGC and Hezbollah’. Relatedly, Israeli journalist Avi Issacharoff reports that increased Iranian support for regional terror organisations is already evident. “Since the [JCPOA] deal was signed, Iran has significantly increased its financial support for two of the largest terror groups in the region that have become political players, Hamas and Hezbollah. In the years before the deal was signed, the crippling sanctions limited this support, which had significantly diminished along with Iran’s economy. But Tehran’s belief that tens, or hundreds, of billions of dollars will flow into the country in the coming years as a result of sanctions relief has led to a decision to boost the cash flow to these terror organizations. Read the rest of that report here. 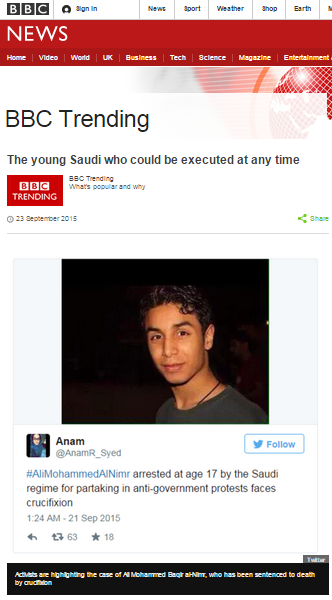 On September 23rd an article by BBC Trending appeared in the ‘Features’ section of the BBC News website’s Middle East page under the title “The young Saudi who could be executed at any time“. The article relates to social media interest in the case of a Saudi Arabian citizen sentenced to death in May 2014. However as readers will see if they follow that link about the election of Saudi Arabia to a UN Human Rights Council panel, the writer of this article had to link to a report on the subject from the Independent – presumably because to date the BBC has refrained from producing any reporting of its own on that matter. Quite why the BBC did not consider it newsworthy when one of the worst human rights abusing regimes in the world bagged a top position at a UN body it regularly quotes and promotes (including on Gaza Strip casualty figures during the summer 2014 conflict) is of course a question in itself. 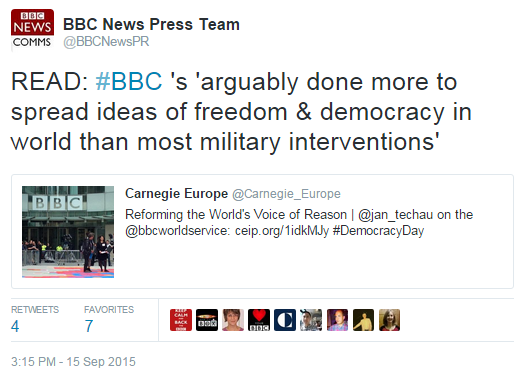 But the timing of this particular example of BBC self-censorship is all the more remarkable because just last week the BBC News Press Team saw fit to promote a particular quote from the latest article by a Carnegie Europe employee (there has been at least one other) extolling the virtues of the BBC World Service on the occasion of the International Day of Democracy. Surely one would expect a media organization which touts its credentials as an agent of freedom and democracy to be among the first to report on the fact that a UN panel responsible for selecting officials who shape international human rights standards has been placed in the hands of a non-democratic, human rights abusing regime which employs medieval-style punishments?